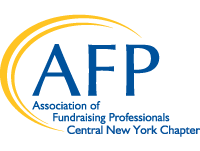 The Central New York Chapter of AFP hosts numerous events throughout the year, open to both members and non-members. We welcome your ideas and feedback for how to make our programming even better. Or if you are an AFP member and interested in helping plan our events, contact us today. AFP-CNY offers scholarships for many of our programs. Please contact us at afpcny@gmail.com if you need assistance.